Since Ikarus the dream of flying is one of the strongest wishes of mankind. To leave mother earth searching the skies, flying high like a bird and floating with the clouds. 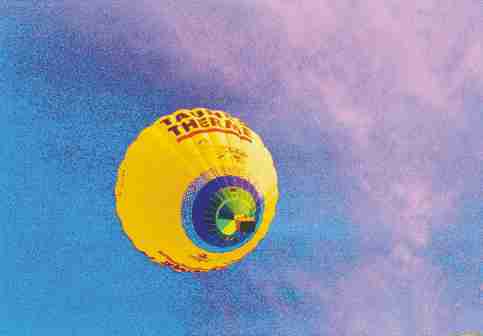 And eventhough man can fly to the moon and anywhere in the world by plane, the flight in a hot-air balloon still remains the dream of a lifetime. To float with the wind with no specific destination belongs to the last adventures. From May to September you can rise with us in the skies over the impressive Münzenburg and float over fields and villages of the Wetterau. 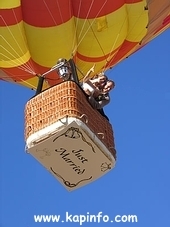 Our “Radio FFH” balloon is well known when she is flying over treetops and roofs of lovelly houses and gardens. Enjoy the quietness of the early morning or the colours of a beautiful sunset. Leave behind the daily sorrows and feel free in the sky. Only 35 km away from the metropole Frankfurt you can find our launch site, between Münzenberg and Wölfersheim / Wohnbach in the Wetterau. 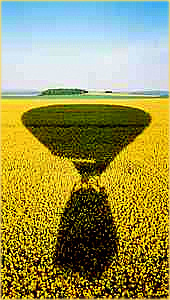 Our balloonflights take place - weather permitting - daily from May to September. We meet at sunrise or about 3 hours before sunset. Our basket accomodates 5 passengers plus pilot.We work according to old sport´s tradition and get our passengers involved in the rigging. Our pilot Udo, with more than 29 years of experience, will explain the technique, procedures and the safety measures. Within half an hour you will be airborne and fly high in the skies while the retrieve vehicle will try to catch up with the balloon. The wind will lead you to your destination and it will be an unforgettable experience to feel safe in nature´s hands wherever it takes you. After a safe landing we pack the equipment on the trailer and celebrate your first flight with Champagne. Please note that our operation in Germany is a german registered non-scheduled airline with all safety standards offered by german law: high experience of the pilot, high insurance, yearly safety tests of the balloon equipment, yearly testflight and special medical check of the pilot. These standards are not guaranteed by private pilots and should be taken into account when you compare prices. We enjoy to fly with a small group of passengers to give you our personal attention and care. The main safety object is the weather, so please be patient if your appointment must be postponed.